Abuja – 14th-15th January, 2019 Traditional rulers and religious leaders including the Sultan of Sokoto, Alhaji Muhammad Sa’ad Abubakar; the Kabaka of Buganda, Ronald Mutebi, Emir of Kano, Alhaji Muhammadu Sanusi, among others discussed ways of keeping African girls in school. The leaders made the discussions during the Regional Conference for African Traditional and Religious Leaders on Keeping Girls in School in Africa. The conference was held at the Nicon Luxury Hotel in Abuja. Limited education for girls hinders Africa’s development– in response to the low enrolment statistics of girl children in schools and the danger this poses to the socio-cultural and economic development of Africa, experts and eminent speakers identified ways to address the disturbing issue. It was at the “Regional Conference for African Traditional and Religious Leaders on Keeping Girls in School in Africa” that was organized by the Sultan Foundation for Peace and Development, that the “slogan” ‘Keeping Girls in School’ was tagged. The three-day event, held at Nicon Luxury Hotel in Abuja, attracted first class monarchs from the north, prominent Nigerian traditional rulers and representatives of major international organisations. The Sultan of Sokoto, Alhaji Sa’ad Abubakar, in his opening remark, lamented that the socio-economic backwardness and technological underdevelopment of many African countries can be attributed to the poor enrolment figure of female children and under-age girls in schools. “Both traditional and religious leaders in our African continent must actively participate in designing, developing and implementing cardinal programmes aimed at empowering our young girls, women and vulnerable mothers. This is imperative as they are the bedrock of societal development. The potential of the girl child is enormous, hence the need for critical stakeholders, governments, traditional rulers, clerics and clergymen to key into the vision of this foundation to enrol and keep female children in schools. “Otherwise,” his eminence said, “realizing their ultimate and divine purpose in life will remain a wishful thought (for girls).”. The Sultan, who chaired the conference, pointed out that maternal and child mortality , poverty, economic stagnation, social upheavals, teenage pregnancy, and political instability, among hosts of problems bedevilling developing countries are due to government and stakeholders’ carefree attitude to promoting girl education. He expressed belief that the recommendations of erudite speakers, religious scholars and gender experts, if aggressively implemented after the conference, will significantly help to curtail the spate of illiteracy and gender discrimination against women , while also fast-tracking socio-economic growth for the continent. “We have been told by experts consistently that development of Africa in every society starts with human capital development. 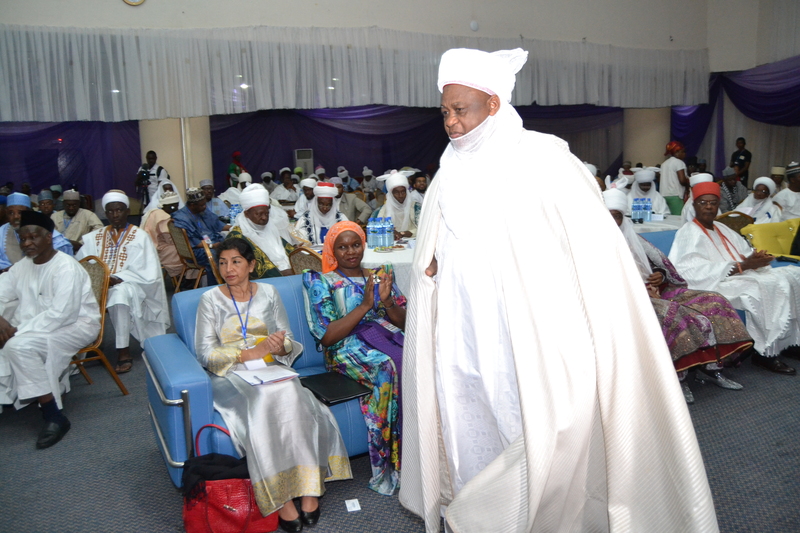 The conference is conceived and designed to address this human capital development deficit,” the Sultan said. In his address, Alhaji Muhammadu Sanusi, The Emir of Kano, said financial resources are needed from the public and private sector to fund girl child education. The Regional Conference for African Traditional and Religious Leaders on Keeping Girls in School in Africa is a three-day conference aimed at triggering a renaissance in Africa, by catalysing a movement in support of girls child education.. It is also aimed at ensuring that African girls and future mothers are educated so that they produce and bring up healthy and educated children who will lead Africa to greatness in the 21st century. President of Nigeria, His Excellency Muhammadu Buhari who was also at the event reminded religious and traditional leaders of their role to advise and assist the government in tackling these challenges. He described traditional leaders as original guardians of history, security, traditions, customs and culture.